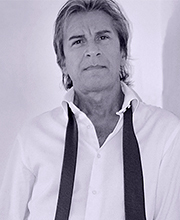 In spite of a long career as arranger, composer and producer, the name of Marco Taggiasco is mostly known by the audience because of his solo recordings and collaborations with artists like DAVID PACK (Grammy Award Winner, vocalist, recording artist and producer), ROBBIE DUPREE (Grammy Nominee vocalist, songwriter and recording artist) or ERIC TAGG (vocalist and songwriter, former Lee Ritenour band member)..
Marco's second album, titled This Moment and released in 2008, features David Pack and Eric Tagg on vocals, as well as other renowned guests and session players. The CD's been reprinted and re-distributed by renowned Japanese label Vivid Sound Corporation with a Deluxe package including 2 bonus tracks. His single Got To Believe This Time, written with Grammy Nominee singer and songwriter ROBBIE DUPREE has had great response from the Westcoast Pop community all over the world. This Moment is a knockout record! Great quality music! You'll never be disappointed. Great stuff, very musical. I like it a lot! In questo sound dove da anni incontriamo tanti buoni epigoni ma nessun caposcuola, This Moment risuona come una delle novità più interessanti.